So when we become a parent, we quickly begin to realize that each child is so different from the next. They may have some similar characteristics of their siblings, but they are truly their own person. Some want loads of friend and social time. Other kids are fine with occasionally seeing their friends. Some teenagers are very self disciplined while others are more creative and easily distracted. As parents, we are the one who love our teen, have studied them from birth and have their best at heart. Our relationship with our teen needs to be a priority. And while it is natural and healthy that outside relationships become very important as our child grows, make sure you remain a key mentor in their life. 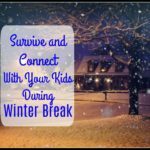 If our ability to spend time with our child is constantly being thwarted, step back and examine the family schedule. We don’t want to wait til there is a crisis to recognize that things are off-balance. Life happens, schedules change so its impossible to strive for perfection. But we don’t want to give up our position in their life thinking somehow that friends, sports or school can replace that vital time spent with you. All too often I observe parents back out of their teenager’s life with the best of intentions. “I don’t see my teen much because their friends come over, and they disappear into his room.” Or “I wish they would stay at home sometimes, but they want to be with their friends,” parents comment. Yes, many teens will choose their friends over family time. However, as parents we have the wisdom of the bigger picture on life. We didn’t typically choose the easy path when our children were younger, like letting them eat whatever they wanted. So we should continue to offer guidance and boundaries that are healthy as they become older in regards to balancing family and friend time. We may not always know how to advise our kids, but we need to be passionate about discovering it. Kids, teens especially, are trying to figure out how to live their life. If our voice is not strong and sure, they will go somewhere else to find a clear direction. It was several years ago when I read Hold On to Your Kids: Why Parents Need to Matter More than Peers by Gordan Neufeld and Gabor Mate. Life changing!! 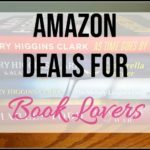 I think everyone I knew grew tired of hearing me talk about this book. It is definitely a must read for every parent and educator. The concepts in the book are straightforward. Kids want to find “true north”. 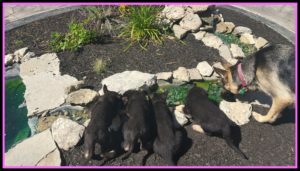 We cannot step down as their parents and tell them to spend all their time with their friends. Otherwise, as Neufeld and Mate warn, their relationship bond with their friends will supersede our role. Teens will then begin to listen to their teen friends for all their decision-making. 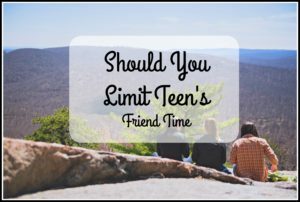 Which leads to my next key to keep in mind when deciding should you limit teen’s friend time. Why do we want our teens to have friends? Typically, if we stopped and thought about it, we would like our teens to have companionship. We want them to have someone to laugh and have fun with, and someone who they can relate to as they go through shared experiences as teens. We should not be expecting our teen’s friends to teach them how to be a responsible adult, right? Because a 16-year-old teenager cannot teach another teenager how to be a responsible adult. That would be ludicrous to think they could! So if one of our main goals as parents is to raise our teenagers to become responsible adults, then we need them to spend time with adults. Friends are wonderful and important, but they can never replace us as the loving (all-wise;) parents! We are too vital! Do you ever wish you could go back to being a teenager? Back to the days when you had more free time and way less responsibility? The teen years are a golden opportunity for a person to focus on themselves. 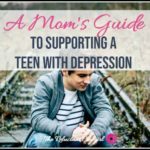 Yes, being a teen can be very stressful and full of emotion. However, teenagers have more freedom and options without the weight of being totally responsible to support themselves. It is the major time in life to begin exploring and developing one’s gifts and skills. They should use their time wisely by devoting their energies to their studies and self-development. Learn more here about ways to encourage teens to develop their interests. Hanging out with friends and letting off stress is valuable. Again, we just need to balance friend time with the all crucial skill development and the time needed to focus on becoming a strong student. As we keep these keys in mind it will help us to make smart choices with our teen as to whether we should limit teen’s friend time. Friends definitely should have a place in a teen’s life. Encouraging and teaching our teens how and where to prioritize friends during the teen years will lead to a healthy balance now and later in adult life. 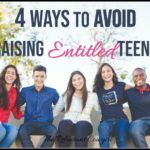 Do you a teen moving on to college? 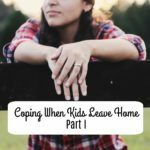 Read Coping When Kids Leave here…a readers’ favorite. What a great article. My oldest starts high school next Monday and I know things will be changing. Thanks for this perspective. It has given me lots to think about. Thanks Julia! The teen years can be great. They just present different challenges:) Hope your oldest make a smooth transition into high school. Thanks Nat for sharing a part of your story! 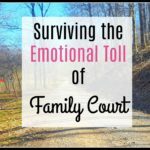 I think it helps all parents to hear that there will be bumps in the road as our children pass into adulthood, but that doesn’t have to be the end of the story.